Recruiting is the life-blood of college football. Coaches work almost year round to convince players to buy into their program and get the kids to believe that their school is the best fit for them. Many elite programs have the luxury of recruiting top-notch in-state athletes, but Oregon has no such luxury. Marcus Mariota, a three star recruit and Hawaii native, became the greatest Oregon Duck football player ever. To begin, Oregon is an elite program. The Ducks are 69-14 since 2008, and while the national championship has eluded us, the numbers prove that Oregon is legit and is here to stay. What is most impressive about the consistent wins is the fact that Oregon has no real in-state pipeline for recruiting – much like the teams in Texas, Florida, and those in the south have. 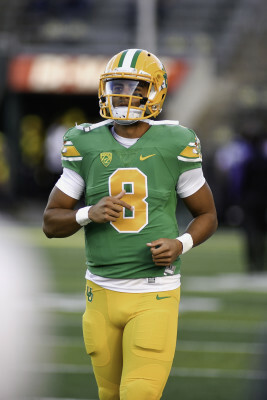 Instead, the Ducks took a relatively unknown three star recruit from Hawaii and watched him turn into a Heisman winner, and one of the greatest college quarterbacks of all time. What Marcus Mariota did for the Ducks would take far too long to explain. But one thing the Heisman winner did was show Hawaiian athletes that Oregon was a good place for a second home. Currently, the Ducks do a great job finding athletes all over the country and they use their close positioning to California well in recruiting. Also, the Ducks have traditionally had a good relationship with the state of Hawaii, but Oregon has a chance to lock down the islands, and Hawaiian and Polynesian players nationwide, after the success of Mariota. Buckner and Kaumatule should anchor the defensive line in 2015. The best player in Hawaii, Canton Kaumatule, has been a long-term Oregon commit. The Hawaiian defensive end has risen to the #15 ranked player according to ESPN, and decided to forgo a visit to USC because he knew Eugene was the place for him. He reminds me of DeForest Buckner, another Hawaiian native, in size and skillset. Buckner, who decided to stay at Oregon for his senior year, should be a high draft pick in the NFL next year and Kaumatule could follow a similar path as he should be the future of the Ducks defensive line. As of right now, the Ducks have three players committed from the state of Hawaii – Kaumatule (DE), Rex Manu (DT), and Dylan Kane (S). Of course no team can get all the talent from one state, but the Ducks should be able to grab top players out of Hawaii fairly consistently, especially if Oregon keeps putting Hawaiians in the NFL. With fans begging for more size in the trenches, a good relationship with the islands could be a great way to achieve that in the future. Recruiting is all about relationships, and the Ducks are building off their already good relationship with Hawaii. I wouldn’t be surprised to see more Hawaiian players chose Oregon as their choice to play football as the years go on. Mahalo Hawaii, Oregon loves you.